For most of us running home labs, having access to actual fully featured production software is a great way to increase skills and familiarize ourselves with software used in the industry. Veeam has certainly taken great strides to empower those in the virtualization community by providing a wide variety of NFR keys that allow using fully featured Veeam products in a non production setting. Let’s take a look at what NFR license keys are and Veeam NFR Licenses for Home Labs that allow virtualization enthusiasts to make use of in the lab/non production environment. If you are not familiar with NFR license keys, let’s look at what these are exactly. Many software companies provide these not for resale license keys to industry professionals who hold certain certifications, who are vExperts, blog, or are community leaders in one arena or another. The real value of an NFR key is that it is typically valid for a 1-year period as opposed to normal trial license keys that are usually only valid for a length of 30 days or so. Additionally, the NFR license keys are fully featured so there are no restrictions in functionality or usability when it comes to utilizing the software in a lab setting. There is nothing more frustrating than having a trial version of software that is handicapped in features/functionality so you are not able to really put the software through the paces. With NFR, you have the most “production like” license keys possible for legal use in testing, labbing, and other learning purposes. For any fellow enthusiasts, I always try to increase awareness of this very valuable tool in learning and home lab setups. Now that we have discussed a little bit about what NFR license keys really are, what Veeam NFR licenses for home labs and other learning are available? For those not familiar, the Windows and Linux agents are the new offering that allows backing up physical Windows and Linux hosts. 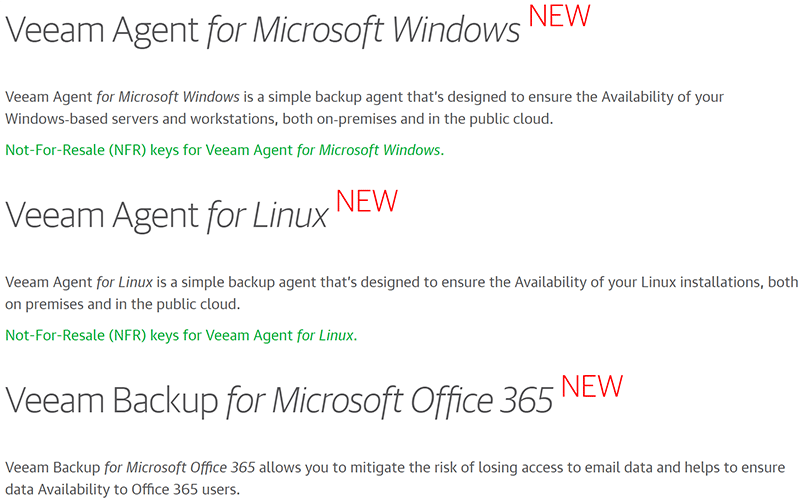 As of Veeam Backup & Replication 9.5 Update 3, the Windows and Linux Agents are tightly integrated into the Veeam Backup & Replication interface. With Office 365, you can back up email accounts in the cloud and facilitate migrations between on-premise and cloud, etc. On the page there is a simple form that you fill out to request the NFR license. Generally, from my experience, the NFR license key is quickly granted and emailed out to the email address you use in the form. The NFR license keys are also shown in your Veeam account once you sign up. I have found that having a home lab is one of the best learning tools that you can have at your disposal. These days there are many options in addition to having a home lab such as labs in the cloud, etc. However, for me, being able to touch the “nuts and bolts” myself, cable, load software, plan and configure networking, troubleshoot issues and put everything together myself is rewarding and teaches concepts that you simply don’t see or have a feel for with cloud based labs. Utilizing NFR license keys is a great way to have access to production, fully featured software with the benefit of having the license key last a year instead of 30 days or so. Veeam is doing an excellent job for the community in providing access to NFR keys to some of the major components of their product line, allowing IT professionals to put it through the paces in their labs. So, if the idea of NFR licensing is new for you, welcome to the world of great learning value! If you were already familiar with NFR licensing be sure to check out Veeam’s offering as it is a great way to get your hands on the software, learn its abilities, and implement and troubleshoot it in production.